It’s a tight finish for Jago Dellow from Paekakariki and Jake Devine from Titahi Bay as they both reach for the last baton in the under 14 beach flags final! 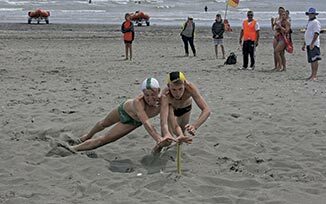 Otaki Surf Lifesaving Club hosted the Capital Coast Under14 Championships recently with 250 competitors from eight clubs from Foxton to Wellington competing on Otaki Beach. The nipper or junior (seven to 14 years) competition saw the clubbies taking part in a number of events both on the beach and in the water, challenging their ability, stamina and reaction times as they competed throughout the day. “A great, awesome day,” Otaki event organiser, Kirsty Doyle said, as they packed up at the end of the day. The weather had been reasonably kind, though cold to start the day and the sea conditions were enough to make events challenging. Always popular are the beach flags events – with competitors racing up the sand for an ever diminishing number of batons, and then the relays to finish the day.